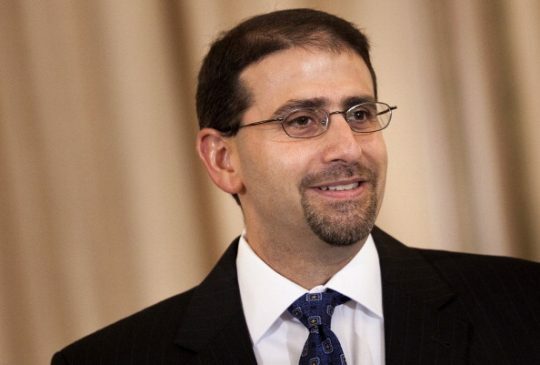 Former Obama administration Ambassador to Israel Daniel Shapiro called on all Democrats to condemn Rep. Ilhan Omar (D., Minn.) for her "outrageous" claims that American politicians support Israel because they're paid off. Omar, who frequently has to deny she's an anti-Semite, stepped into controversy again on Sunday when she suggested in a tweet that House Minority Leader Kevin McCarthy (R., Calif.) was being paid off to criticize her and Rep. Rashida Tlaib (D., Mich.) for their anti-Israel stances. When asked by a liberal magazine editor who exactly was paying politicians to support Israel, she wrote back "AIPAC," the pro-Israel lobbying group. Even some progressives criticized Omar for the tweets, which they said smacked of anti-Semitic tropes against American Jews. Shapiro, who was appointed to the post by Obama in 2011 and served until 2017, sent a flurry of tweets Monday morning that called for Omar to be "condemned by all in our party." "Her support for BDS is apparently her essence: blaming Israel alone for the conflict, absolving Palestinians of all responsibility, delegitimizing Israel's very existence, &accusing its supporters of shallow motives &manipulation by Jewish money," he wrote. 3. But these efforts have failed. Her support for BDS is apparently her essence: blaming Israel alone for the conflict, absolving Palestinians of all responsibility, delegitimizing Israel's very existence, &accusing its supporters of shallow motives &manipulation by Jewish money. "Her approach indicates she doesn't want to be a consensus builder or understand others' views. She wants to push her extreme view, embarrassing her Democratic colleagues who inevitably are asked to respond. She's made herself a lightning rod. It will isolate her. And it should," she wrote. 5. There's plenty of room to differ w/Israeli policy, settlement expansion, the drift away from two-states, etc. Criticism of Israel's actions is not, by definition, anti-Israel or anti-Semitic. It should also take account of Israel's legitimate security concerns & many threats. 6. Supporting Palestinians' legitimate aspirations for statehood &sympathy for their current hardships are mainstream &eminently reasonable. Any honest assessment would also take account of their leaders' responsibility for terror, incitement, &rejecting any legitimacy of Israel. 7. Omar has many colleagues who've modeled how to strike this balance for years: supporting Israel's security &legitimacy &close US-Isr ties, supporting 2 states for 2 peoples, criticizing each side when warranted, differing with/Trump's approach that helps entrench the conflict. 9. She could have avoided delegitimizing those who disagree with her as being in the thrall of campaign contributions, instead of acting on their own & their constituents' beliefs. Had she done so, she could have also educated a lot of people to consider views they may not have. 10. Now, instead, she'll have much of DC, many in her own party, much of the Jewish community, &plenty of others turning against her. She did that. She chose that. She had little influence on Dem party positions on Israel/Palestine before. Thankfully, now she'll have even less. 11. No one is trying to silence her. She can advocate any policy she wants. And if she'll listen, we should keep the door open. Meanwhile, those who strongly disagree with her views and find them ill-informed, offensive, and even anti-Semitic also have to speak up. We must. End. Omar's latest tweets were also condemned by conservatives and some fellow liberals, including Chelsea Clinton and Democratic Reps. Max Rose (N.Y.), Sean Patrick Maloney (N.Y.), Tom Suozzi (N.Y.), and Anthony Brindisi (N.Y.), Josh Gottheimer (N.J.), and Donna Shalala (Fla.). This entry was posted in Issues and tagged Anti-Semitism, Dan Shapiro, Ilhan Omar, Israel. Bookmark the permalink.